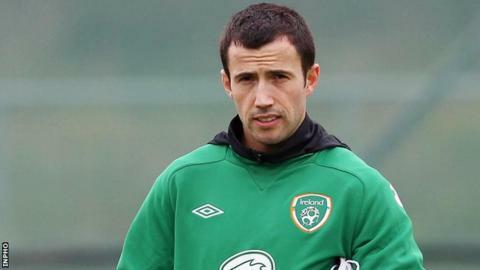 Birmingham City midfielder Keith Fahey has been forced out of the Republic of Ireland's Euro 2012 squad by injury and will be replaced by former Derby County player Paul Green. Fahey has been struggling with a groin problem and was ruled out after undergoing a scan on Saturday evening. Green, 28, is currently without a club after turning down the offer of a new contract from Derby earlier this month. The ex-Rams midfielder has 10 Republic of Ireland caps. Fahey, 29, scored scored the opening goal of Republic's Euro 2012 qualifying campaign in Armenia. A Football Association of Ireland spokesman revealed that Fahey, who has 15 caps, had a scan after Saturday's 1-0 friendly win over Bosnia-Hercegovina. "During the warm-ups at today's match, Keith Fahey felt something not quite right. He was scanned following the match," said the FAI official. "The FAI medical team have just received the results of the scan which showed unfortunately that his groin strain was persisting. "The results were discussed with the player and he agreed that would not recover fully in time for Euro 2012. "As a result, he is departing from the squad and Paul Green is being called in. "[Manager] Giovanni Trapattoni spoke to the player, who is very disappointed to miss out on Euro 2012, and told him that he remains part of his plans for the future."